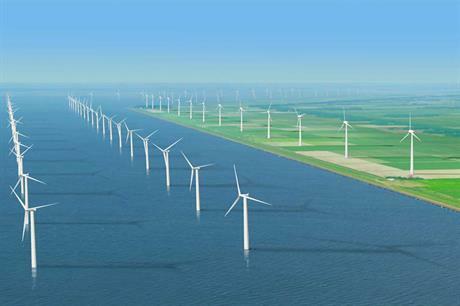 NETHERLANDS: Siemens Gamesa and Van Oord are set to build an 89-turbine near-shore wind farm in the northerly Ijsselmeer Lake. The companies have been named as preferred contractors for the Fryslân wind farm, which will be built next to the Afsluitdijk dam, on the northern shore of the lake. Van Oord will design, build and install the foundations and cables for the 382.7MW project, and will supply the equipment for installing the turbines. Siemens Gamesa, meanwhile, will design, build and commission the onshore substation and 89 of its SWT-DD-130 turbines, each with an individual capacity of 4.3MW. The turbines, which have a 130-metre rotor diameter, hub height of 109 metres and tip-height of 174 metres, are typically delivered with a rating of 4.2MW. Siemens Gamesa will also service the wind farm for at least 16 years, under the contract with Windpark Fryslân. The developer was previously involved in the development of the Westermeerwind project — another near-shore wind farm in the Ijsselmeer Lake. The final contracts for balance of work and turbine suply and installation are expected to be signed later this year. Construction is due to start in 2019 and Fryslân is planed to be fully operational by mid-2021. Van Oord and Siemens Gamesa will also use soil material from the Ijsselmeer Lake to create a new nature conservation island next to the dam. It will include 20,000m2 of new land and 250,000m2 of sheltered shallow water. Other conservation areas will also be created on the banks of the island, both above and below water, the contractors stated. They will be designed to attract fish and birds for foraging and resting. Van Oord and Siemens Gamesa being named as preferred contractors follows Windpark Fryslân signing a contract with Dutch infrastructure company Visser & Smit Hanab for the project’s 25-kilometre 110kV cables. Power from the Fryslân wind farm will be connected into transmission system operator (TSO) Tennet’s grid at Bolsward in Friesland. The province of Friesland wants to source 16% of its energy consumption from renewables by 2020.